Apart from the XC90 T8 plug-in hybrid, Volvo Cars will also bring four more PHEVs in India in the next three years. In 2017, Volvo announced that all of its new cars will be electrified from 2019, and the company is targeting over 50 percent of its global sales to come from electric and hybrid vehicles. 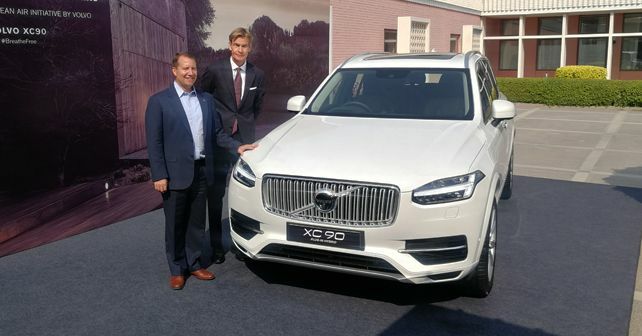 Now, in order to bring itself in line with the brand’s global business model, Volvo Cars India has announced that they will start assembling the XC90 T8 PHEV (plug-in hybrid) locally by the end of 2019. The Swedish luxury car manufacturer is also going to bring four more PHEVs in the country in the next three years. With the roll out of the XC90 T8 PHEV planned for next year, Volvo will become the first manufacturer to locally assemble a plug-in hybrid luxury/high-end car in the country. The plug-in hybrid version of Volvo’s flagship will be produced at the company’s assembly plant in Bengaluru. The regular D5 version of the XC90 is already being assembled at the very same unit since October 2017. There’s no doubt that Volvo will be banking heavily on plug-in hybrids in the future, especially in nascent markets likes ours. As the company also points out, plug-in hybrids don’t need any nationwide infrastructure, so they’re economically feasible. At the same time, Volvo provides its customers with two charging stations with every purchase. The general idea behind is to have one installed at your home and the other in your workplace. Also, the company claims that 87 percent of the cars in India have an average commute of 30km in a day. To put that into perspective, the XC90 T8 PHEV has a range of 43km in ‘pure’ electric mode. For most people, a charger at two places will ensure that they can do their daily commute on electric power alone. While over the weekends, there’s always a supercharged 2.0-litre petrol motor in reserve. Volvo’s main challenge, however, will be to increase PHEV awareness among customers of high-end cars. The company already sells the XC90 T8 PHEV here, so product placement of other plug-in hybrids shouldn’t be a problem since Volvo has always been able to price their cars aggressively in our market. Overall, Volvo’s initiative to promote plug-in hybrids in the country should definitely work in its favour in the long run, because while everyone wants to go electric by 2030, PHEVs will serve as the perfect transition between internal-combustion engines and full electric vehicles.